Crazy in Suburbia: So we have Mean Girls, but what about Mean Moms? 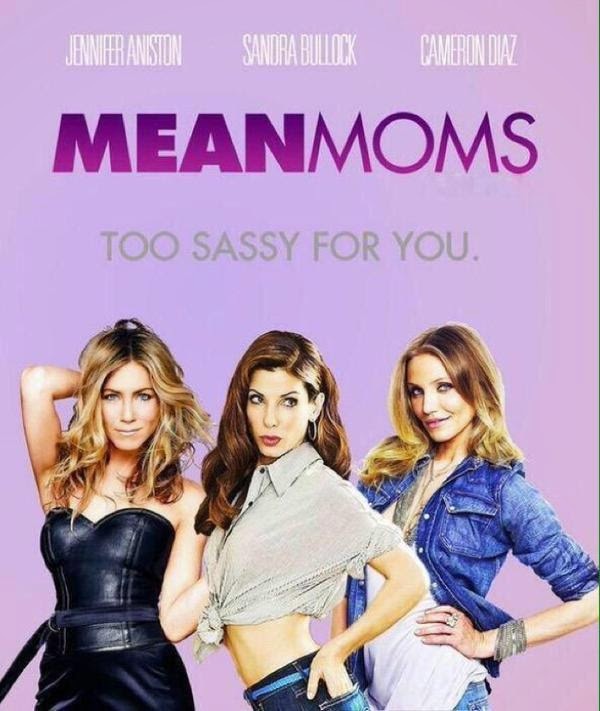 So we have Mean Girls, but what about Mean Moms? Yes, apparently it's true. The catty, sneaky, back-stabbing style of "girl world" fighting that's prevalent in films like Mean Girls and Heathers starts much younger than high school or even middle school. It starts young -- preschool young. I recently published this story in the Contra Costa Times, which has experts proposing that "relational aggression" -- as opposed to the punching, shoving and physical aggression among boys -- is a daily reality for some girls, including some as young as 3 to 5. In gathering real people's stories, I heard from a number of parents, some from here in Walnut Creek, about their daughters' experiences with mean girls at school. But there is one fascinating sub-plot that I didn't have space to explore. It's apparently a related phenomenon: the prevalence of Mean Moms. Several people told me about Mean Moms at their kids' elementary, middle and high schools. I recently and inadvertently ran into one of these High School Mean Moms myself. And, these parents said, these Mean Moms very likely role model the clique-ish, exclusionary, bratty behavior exhibited by their kids, from preschool to high school. Not long ago, Mean Mom behavior was rampant at one Walnut Creek elementary school, a source I'll call Anna, told me. It reflected the extent to which Mean Girl behavior had become a huge issue at the school, so much so that, according to Anna: "the principal had all the girls by the time they were in fifth grade meeting the counselor once a month." Anna added: "I recall (the principal) saying several times how uniquely 'mean' our girls were to each other." Unfortunately, the principal couldn't mandate meetings for these girls' mothers. Anna definitely saw a link to the behavior of certain girls and their mothers: "One of the things that struck me about this school during the time was that the moms themselves were very cliquey and seemed to encourage this behavior with their girls." According to Anna, there were the two moms in particular, whom I'll call "Kris" and "Bethany." They became friends while their daughters were in kindergarten. When a third girl wanted to schedule a playdate with Kris's daughter, Kim, Kris said no, that Kim didn't need friends other than "Bryn," Bethany's precious little girl. For most of elementary school, Kim and Bryn would sometimes allow other girls into their circle but would exclude many others. But by fifth grade, Kim and Bryn were no longer friends, which left Kim herself vulnerable to bullying. Some of us might think, good, Kim's getting a dose of her own poison, but bullying is bullying and it's never right. Anna also told me about the case of Girl Scout Mom, who was also active in the PTA. I guess she was a Queen Bee/Regina George type with a more outwardly altruistic, public service bent. (Regina George is the teen Queen Bee character played by Rachel McAdams in the film Mean Girls.) Cynical me has seen plenty of socially aggressive types who often try to attain power and influence anyway they can, and they often do it by veiling their power-hungry impulses with "good works." Anyway, Girl Scout Mom liked to get together with other moms she favored and dish about some of the little girls in the class. In a divide-and-conquer move that psychologists and child development researchers say is popular among socially aggressive females, Girl Scout Mom split the troop in two and tried to prevent little girls she didn't like from joining her trop. It's no surprise, Anna says, that Girl Scout Mom's daughter was a pretty mean specimen during elementary and middle school and is still at it in high school. Speaking of high school, while I was working on this story, I was alerted to some Mean Mom stuff and parent cliquishness stuff going on at my son's high school. It was startling to hear. For one thing, I graduated from high school some years ago (more years than I'll recount here), and had come to think, naively so, that all this popularity and cliquishness crap around a high school community was something that the kids may have to put up with. But supposedly, you would think, that the parents -- people my age -- have grown out of this. But I learned that's not entirely case: there are a few parents who seem to be totally caught up in the clique-y-ness going on at their kids' high school. They have their social groups that may have formed way back in their neighborhoods or around swim clubs or traveling soccer teams. They continue to bond over their kids' activities. They might sit together at football games or other events or head leadership committees for fundraisers or other school events. It may be a case of parents wanting to do their best to ensure a healthy, happy educational experience for their sons and daughters. Or, it's another version of parents trying to live out their hopes and dreams through their kids. I'm not part of the Popular Parent Crowd, if there is such a thing. I'd say that most of the parents who seem to be part of this group come across as nice and genuinely interested in doing good things for the school, the kids and the community. Without them and the work they do, the school probably wouldn't have money to fund school sports, and the students wouldn't have help putting on their proms and senior all-nighters. Then again, I was talking to one high school mother I'll call Jane who moved to this area a couple years ago when her son was a freshman. She had been a long-time school volunteer back in the Midwest and had plenty of professional fund-raising, event-programming experience. At back-to-school meetings and the like, she was exhorted to get involved, volunteer, put in time. She put her name on various sign up sheets, but never heard back. Certainly, she received emails asking her to sign up to bring dishes to sports group gatherings or to donate a few hours to set up for proms or other events. But she never heard from anyone who was interested in mining any of her knowledge or expertise on planning events or building community good will. In some ways, the indifferent shoulder this mother received reminds me of something I heard at a national conference for dad bloggers a couple months ago. A male Facebook executive said he was routinely shut out of opportunities for leadership roles in volunteering at his kids' private San Francisco school because he was a working dad -- and not part of a long-term moms' school volunteer coterie. He said dads were mostly called on to bring their tool kits and build stuff -- sets for plays or snack shacks for football games. His story reminded me of Jane's story. She was left to wonder if she was being sidelined for certain types of school involvement because she and her family were new to the area, which meant her kids hadn't grown up in certain neighborhoods, attending certain schools, or, in the case of Walnut Creek, devoting their summers at certain community swim clubs. At around the same time, my Mean Mom encounter occurred, ironically or not, when I was reporting on the Mean Moms story. One night, this woman, whom I never met, lit into me via social media, accusing me of "ranting" about a certain topic of local interest. Yes, I have been known to rant. I'm an occasional blogger, after all, and ranting is what we bloggers sometimes do. I admit I picked the wrong context in this case. That's my bad. Anyway, this mother told me I was being ridiculous, and maybe I was. But then, she said took things too far, by saying disparaging things about my "kids" (I only have one) and me professionally. What was curious is that over the next few days, I was contacted by other parents who saw her posts and were disturbed by her comments. "I have no desire to know her," one friend wrote. Another friend, who's pretty enmeshed in the school/parent/volunteer community, warned me I should probably watch my back, because apparently this woman is effectively Popular High School Mom. She's super-involved, and in the Popular Parent Crowd. She may be like Girl Scout Mom in that she veils certain power-hungry impulses in good works, hosting events or donating to education funding efforts -- and getting her name prominently listed in foundation newsletters. So, her "good works" and Popular Mom status give her the power, according to this friend, to decide if certain parents will be included or shut out of certain volunteer committees. I have no idea if any of these claims about Popular High School Mom are true, but it was amazing to learn that there was a parent in the school who had gained this kind of Mean Girl/Mean Mom reputation. I thought, really? It's still curious, weird and disturbing that this kind of stuff goes on. I mostly feel bad for the parents of younger kids -- the ones I wrote about in my Times article -- who are still trying to walk their kids and themselves through the treacherous path of Mean Girls and and general bullying -- as I'm learning -- the Mean Moms who raise these kids. Mean Moms...what do we do about them? My husband and I moved across the country to get away from the mean moms. We've had to hire an attorney to deal with another mean mom who wanted to sue us for monetary damages brought on by "extensive psychological help" that her daughter needed after a playground argument with my daughter. And now, I have a husband and a wife who won't stop texting and calling because their daughter has them believing that I'm spreading lies about her daughter! I would like to know when and how I would have the time to carry out petty rumors when I am employed, attending graduate school, AND raising kids. I've given up on making friends with moms. My circle of friends now consist of men in academia, because they don't give a crap about cliques, birthday parties, unpresentable manicures or who's invited who to a sleepover. At this rate, women are never going to find equal ground in the work place if they keep this up! Ugh! This is the entirely predictable result of the era of the helicopter parent. If you continually tell your child how brilliant and special and better than everyone else they are, regardless of how they act or what they achieve, then don't act so surprised when they behave that way. Some moms can be mean, but you never know what they had to endure earlier in the day. Of course, that doesn't make it acceptable, but it pays off to be empathetic. Empathy goes a long way. This is simply the answer for parents who feel they need fortification for doing the right thing when raising their kids. I am from Europe living in Monterey, CA area. It seems that this negativity exists everywhere in the US and abroad. It is comforting to know that we are not the only ones. I never experienced this "mean girl" "mean mom " behavior until my child was born and I was forced to interact with parents. We live in a middle class area and we were ostracized because we were kind, educated, gracious and inclusive. I pulled my child out of the local school because I didn't want her to be treated like a second class citizen by upstarts with pea brains. I was very depressed and my child became anxious and unhappy because of the mean behaviors of the kids and catty mothers. It hurts to be not included and leaves lasting scars. We were volunteering, donating time and money but they didn't want us because we didn't follow the herd mentality. Instead, we traveled to the next town to a new school and enrolled in activities as far away as possible where there was social diversity. I find that many of the working class and lower middle class families are nicer and more inclusive. Its sad that we are raising kids in a dog eat dog society in which greedy ambitious parents are driven by envy and insecurity and don't value real friendship and loyalty to ones neighbours. It's all about the competition and backstabbing and the kids are learning from their mean parents. I continue to teach my child to model kindness and to stand up to bullies. Sometimes killing them with kindness is the best medicine but keep them at an arms length. For better than 3 years now, I've been having to deal with a "Mean Moms" cub scout (now troop scouts) Clique. When my 10 year old joined cub scouts, his first den leader ended up dropping out from den leading. Since my older son had been with scouting for a very long time, I had already had several years of scout mom experience. I took on den leading however, a certain clique only let it last for 2 years. Tell you why: First off, I had no idea that all the lady leaders had been a well established clique before my younger son joined therefore I went about my own business lining up requirements and other things for my den both by myself and with my husband. Well, as time went by, my den was earning several buckles plus their rank badge and were doing great. There was a den dad who would constantly be on his phone and refused to participate in activities with his child and the rest of the group. He went to the clique before the end of the 2nd year, complained behind my back, He and the clique called around to find out how to get rid of a den leader who was doing right by scouting and who was determined to uphold maximum teaching capacity and Bam! Come a false committee meeting set up by the clique designed to oust a den leader. There was more than just a hateful den dad's complaint behind it though. The Queen Bee and her ladies in waiting were jealous and angry that an experienced scout mom was successfully leading a den full of hardworking children and attentive den parents who all earning several awards for their accomplishments, kids were credited for their work and said den leader didn't join the self /adult glorifying clique. Instead, they tried to get revenge by throwing an innocent den parent of a handicapped child under the bus and expected ME to buy it as a reason for being ousted. Suffice it to say, thinking they had me intimidated Was a bad move on their part. I was asked to join my older son's troop committee and to be straight- I've been there ever since. Queen Bee and the ladies in wait have kids in the troop now too however, their reign of terror isn't over. They believe they're going to usurp all 10 leaders of the troop. Before a committee meeting, they were all caught starting a divide and conquer cut down session with the current scout master. Little does the clique know, several troop leaders already know what the clique did and since all 10 scout leaders have been on the troop side for several years and years, Yeah, No, Not this time Clique and no way they're going to usurp just to oust people and take control where they will never be handed authority to do so.